This movie was a debut for me in many aspects. First and foremost attraction was Marilyn Monroe. All I heard previously, she was beautiful, she died young and she was a good friend of John F Kennedy. Ofcourse she was married to baseball player Joe Di Maggio briefly. I wanted to watch this movie mainly to see Monroe. One isnt disappointed with the introductory scene where in the steam exhaust just kindles her hip as she is walking on a railway platform. She plays the role of Sugar Kane Kowalczyk, a lead singer in a all female band. 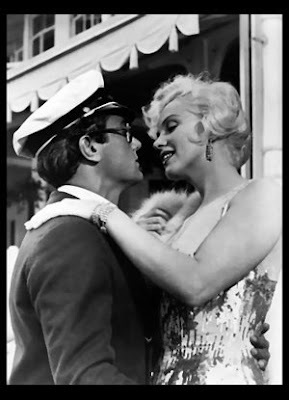 If Monroe’s looks were something, check out Tony Curtis and Jack Lemmon in their comical best. The story starts with a massacre on St. Valentine’s Day which is witnessed by Joe (Tony Curtis) and Jerry (Jack Lemmon) in Chicago. The mob is after these two and to escape from the city they find themselves disguising as Josephine (Tony Curtis) and Daphne (Jack Lemmon). They end up joining the All-Female music band. They head to Miami for a performance. Joe falls for Sugar but cannot reveal his identity. Jerry is also attracted to Sugar but he is last in this race as a rich millionaire (Joe Brown) falls for Daphne. Joe dressed like a rich man impresses Sugar and utilizes the millionaire’s yatch while Daphne is busy with the millionaire. Joe uses Cary Grant’s accent while he seduces Sugar. 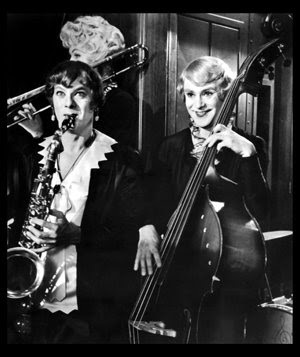 Apart from a romantic scene where Joe and Sugar seduce each other, most of the thunder is stolen by Jack Lemmon’s portrayal of Daphne. The Tango scene picturised on Daphne and millionaire is one of many comical moments which are to be treasured in one’s memory. The dialogue delivery and the dialogues are hilarious. Look out for series of comical events when mob come to Miami for a convention. They encounter Joe and Jerry and rest is funny. 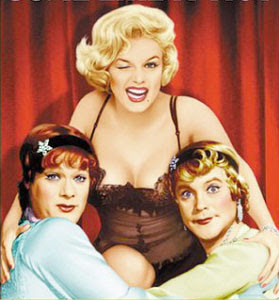 The movie was shot in black and white much against the contract which stated all Monroe’s movies to be pictured in color at that time. Due to the green tinge prominent on both Tony and Jack’s face, color movie didn’t seem to be the way to go. This movie was so inspiring that in 1975 Bollywood made a movie called “Rafoo Chakkar” staring Rishi Kapoor, Neetu Singh and Paintlal. Each frame resembles ‘Some like it hot’ barring songs. Released in 1959, this movie won an Oscar for best costume design for a black and white movie and Jack Lemmon was nominated for Best Actor in a leading role for his cross-dressing portrayal of Jerry and Daphne. Directed by Billy Wilder, this movie ends with one of the all time favorite dialogues when Daphne reveals he is a man and he cannot marry to the millionaire….. Millionaire coolly replies “Well nobody is perfect”. I've always wanted to see it, its in my Netflix queue.